Vincent: The rest is in a safe place. Remember what happened to action movies after Die Hard came out? A lot of action films were made that basically amounted to things like “It’s Die Hard on a boat” or “It’s Die Hard on a train” to varied levels of success, but one thing was for sure, Die Hard changed how a lot of people and studios wanted to make action films. That has somewhat subsided in favor of other types of action cinema, ranging from the slow-mo escapades of John Woo-like films to the bombastic extravaganzas of Michael Bay features, or the shakiness inspired by Paul Greengrass’s work on the Bourne series. 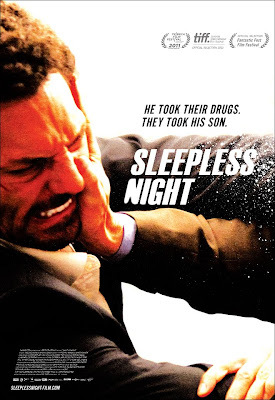 Sleepless Night is a French thriller that feels like a call back to the Die Hard days, placing an ordinary man in incredibly tense, violent, and stressful situations within a nightclub. It is well made from an impressively complex level rather than a stylish one and features action bits that feel very natural. Some minor plot flaws aside, the film is solid. The film begins with a drug heist that goes wrong. Two men attempt to rob two drug carriers, but one of the carriers stabs a robber and is killed, while the other gets away. The drug carrier that escaped even managed to see the face of one of the robbers. The robbers did manage to steal the drugs however, which becomes more interesting once we learn that the robbers are in fact two police officers. Our lead, Vincent (Tomer Sisley), was the one who was stabbed, but finds that he has even more to worry about, due to what happens next. The drugs that Vincent and his partner stole belong to a powerful mob boss/nightclub owner, Jose Marciano (Serge Riaboukine), who kidnaps Vincent’s son in an effort to force Vincent to give back what he stole. Vincent now has until the end of the night to return the drugs and save his son. This leads to a long and exhausting ordeal, which finds Vincent losing control of the situation frequently, as returning the drugs is not as simple as it could have been, given the presence of a couple internal affairs officers that follow him to the nightclub. Tired, wounded, and relying only on his wits, Vincent will have to do whatever he can to get his son and leave safely. While films like Die Hard and Taken clearly come to mind when watching and describing this film, the other clear influence, right from the start, is The Dark Knight, which I found equally intriguing. The opening heist, right down to the score, is very similar to how The Dark Knight opens, and there is a way in which the action is filmed, which continues that notion. There is a realistic element to how things play out, which keeps it in the same realm as a lot of these Die Hard-like films, but it tries to setup a lot of the tension through the use of its music and various reactions to what is taking place, in addition to the actual action that occurs. Having spoken about the action, Sleepless Night relies less on actual fights and gun battles and more on cat and mouse-related thrills. Given the nightclub setting, that makes the film even more intense, as we see Vincent barrel his way through huge crowds, with the camera following him at a close distance. It certainly appears to be a complicated film to have shot, given the vast amount of people present. Observing the way that the film establishes its location is a compliment to the film as well, since the geography of the film seems so clear. The nightclub has plenty of areas for Vincent to either evade his foes or fight them, and we are quite clear on where the locations are in relation to the characters. In addition, when there is violent action in the film, it is intense. One sequence features two people improvising their way through a kitchen, using all that is at their disposal to try and takedown the other person. When this film wants to get more hectic, it goes there and does it well. The biggest reason as to why Die Hard is such a key film to reference is the nature of our lead character. Vincent is very human. He bleeds, he makes rash decisions, he is vulnerable, and nothing is ever easy for him. The added difference is the fact that Vincent is a little more morally questionable, given that we are not quite sure how on the level he is. We know that he cares for his son, but the reason as to why he steals the drugs is never completely made clear and we also see him take some questionable actions towards others in the nightclub. With all of this in mind, Tomer Sisley is fantastic in the role. He does well at portraying the heavy amount of stress his character faces, which really worked in keeping me incredibly engaged with how the film would play out. The other focus of the film concerns the various other characters involved; namely the villains, which supplies both positives and negatives for the film. On the one hand, the fact that they are not very confident keeps the film set in a semi-realistic world, from an action film standpoint. Still, there is no question that some poor decisions are made by many of these people over the course of the night. The plot never becomes too overly complex, but the various character relationships becomes a pretty twisty ordeal to keep up with and it somewhat distracts at times or makes you question better ways one could have handled a situation. Getting back to the direction and construction of this film, writer/director Frédéric Jardin did some great work for a film whose tagline states, “He took their drugs, they took his son!”. On the one hand, the premise is very simple, but Jardin did a lot of solid work in complicating things for Vincent and the other characters, without making anything far too complex for the audience to work out. Despite questionable choices, we understand the motives of the main players involved and get to enjoy a lot of the clever setups that have interesting pay offs as the film moves along. A lot of credit also goes to how well the tension is built in this film, which is a real key to making Sleepless Night such a success. I really enjoyed this film for what it accomplished. Despite the references I have made, Sleepless Night does not feel like a knock-off of any of them, but rather a strong, well-made entry into the genre. It provides a cool and claustrophobic location (despite the presence of so many people) to base an action film in and a morally ambiguous hero (approaching anti-hero) to follow. 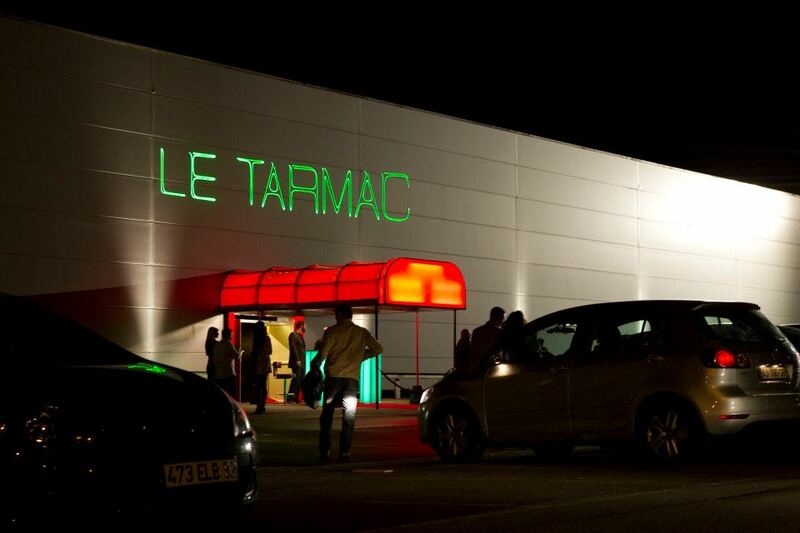 The film is tightly paced, especially once we get to the nightclub, and provides plenty of clever thrills throughout. It is a solid film that I hope people go and seek out. Vincent: Thomas…I’m coming to get you.